Louis and I see you nearly at the same time. In the woods, through the bee trees whose heavy, sweet smell will forever remind me of this day, I see flashes of your pink summer nightgown that you wore to bed last night. My chest loosens and I am shaky with relief. I scarcely notice your scratched legs, muddy knees, or the chain in your hand. I reach out to gather you in my arms, to hold you so tight, to lay my cheek on your sweaty head. I will never wish for you to speak, never silently beg you to talk. You are here. But you step past me, not seeing me, you stop at Louis’s side, and I think, You don’t even see me, it’s Louis’s deputy sheriff’s uniform, good girl, that’s the smart thing to do. Louis lowers himself toward you, and I am fastened to the look on your face. I see your lips begin to arrange themselves and I know, I know. I see the word form, the syllables hardening and sliding from your mouth with no effort. Your voice, not unsure or hoarse from lack of use but clear and bold. One word, the first in three years. In an instant I have you in my arms and I am crying, tears dropping many emotions, mostly thankfulness and relief, but tears of sorrow mixed in. I see Petra’s father crumble. Your chosen word doesn’t make sense to me. But it doesn’t matter, I don’t care. You have finally spoken. Antonia describes herself as a bad mother while Louis reassures her that she, indeed, is a good mother. What evidence from the book supports each of their beliefs? How does Louis’ history with Antonia effect his own decisions as a husband and father? Antonia and Louis’ long history together is integral to The Weight of Silence . As a deputy sheriff, what, if any, ethical or moral boundaries did Louis cross in the search for Calli? Ben and Calli grew up with an abusive, alcoholic father. Knowing that abuse is often passed on from generation to generation, what are Ben’s and Calli’s chances of breaking the cycle of abuse in their future relationships? What instances from the book lead you to believe this? How does the death of Antonia’s mother play into the decisions Antonia made as a wife and mother? How do you think Antonia’s life would be different if her mother had lived? Martin Gregory, a proper, disciplined professor of economics has always valued order, predictability, and restraint in all areas of his life. How does his decision to seek retribution against the man he was sure violated his daughter fit into his belief system? Antonia, Louis, Martin, and Petra’s perspectives are told in the first person present tense point of view while Calli’s is told in third person past tense? Why do you think the author decided to write the story in this way? 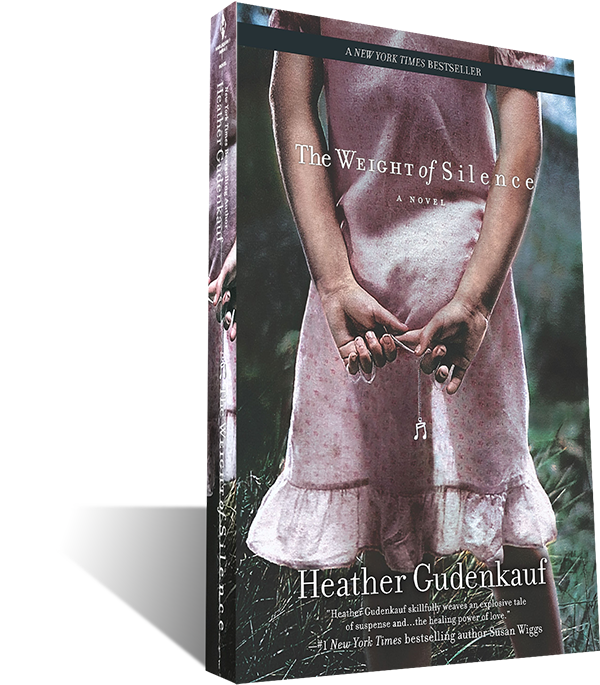 What does the title The Weight of Silence mean to you? How does the title relate to each of the main characters’ lives? Before Calli and Petra’s disappearance, the Willow Creek Woods was a haven for Calli, Ben, and Toni. Calli, fearful of the forest after her ordeal, asked her mother if she ever got scared when walking in the woods. Toni replied, “It sent you back to me, didn’t it?” What did Toni mean by this? Martin Gregory had worked so hard to leave behind his farming roots by becoming a college professor, but after Petra’s abduction and serious injuries, Martin subsequently moved with his family from Willow Creek to a farm. Why did Martin and Fielda decide to do this? Toni describes Calli and Petra as “kindred spirits.” What makes their friendship so special? Do you think Calli and Petra’s friendship will last into their adulthood? Why or why not? Who do you consider to be your kindred spirit? Why?